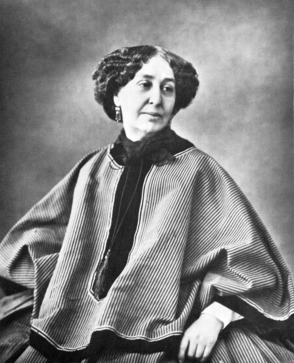 George Sand in 1864 (picture by Nadar). George Sand was the pseudonym of the French novelist and feminist Amantine-Lucile-Aurore Dupin, later Baroness Dudevant (July 1, 1804 – June 8, 1876). Sand was an author of romance novels. The romance novel, as distinct from the ninteenth century tradition of Romanticism is one in which love conquers all, overcoming all barriers, including those of social class. In the traditional formula, two lovers face insurmountable obstacles which must be overcome in order to become one. The popularity of the romance novel played a role in the development of "romantic love" as the basis for marriage in Western culture. Her novels also expressed her love of the countryside. Born in Paris to a father of aristocratic lineage (from a grandaughter of Maurice, comte de Saxe and a distant relative of Louis XVI) and a mother of common descent, Sand was raised for much of her childhood by her grandmother at the family estate, Nohant, in the French region of Berry, a setting later used in many of her novels. In 1822, she married Baron M. Casimir Dudevant (1795–1871), and they had two children, Maurice (1823–1889) and Solange (1828–1899). 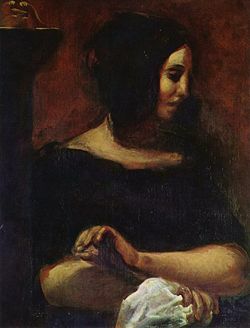 George Sand as portrayed by Eugène Delacroix in 1838. This portrait was originally part of a larger painting showing both George Sand and Frédéric Chopin. She was linked romantically with Alfred de Musset (summer 1833–March 1834), Franz Liszt and Frédéric Chopin (1810-1849) whom she had met in Paris in 1831. Later in life, she corresponded with Gustave Flaubert; despite their obvious differences in temperament and aesthetic preference they eventually became close friends. She was engaged in an intimate friendship with actress Marie Dorval, which led to widespread but unconfirmed rumors of a lesbian affair. . In Majorca one can still visit the (then abandoned) Carthusian monastery of Valldemossa, where she spent the winter of 1838–1839 with Frédéric Chopin and her children. This trip to Mallorca was described by her in Un Hiver à Majorque ("A Winter in Mallorca"), published in 1855. She left Chopin shortly before he died from tuberculosis. Drawing from her childhood experiences of the countryside, she wrote the rural novels La Mare au Diable (1846), François le Champi (1847–1848), La Petite Fadette (1849), and Les Beaux Messieurs Bois-Doré (1857). Her other novels include Indiana (1832), Lélia (1833), Mauprat (1837), Le Compagnon du Tour de France (1840), Consuelo (1842–1843), and Le Meunier d'Angibault (1845). Further theatrical and autobiographical pieces include Histoire de ma vie (1855), Elle et Lui (1859) (about her affair with Musset), Journal Intime (posthumously published in 1926), and Correspondence. Sand often performed her theatrical works in her small private theatre at the Nohant estate. In addition, Sand authored literary criticism and political texts. Her most widely used quote was: "There is only one happiness in life, to love and be loved." Also, she was one of the few female pipe smokers. 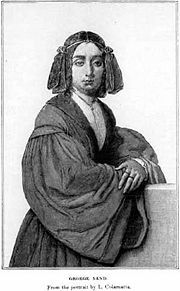 George Sand died at Nohant, near Châteauroux, in the Indre département of France on June 8, 1876 at the age of 72 and was buried in the grounds of her home at Nohant. In 2004, controversial plans were suggested to move her remains to the Panthéon in Paris. Chopin (2002, director: Jerzy Antczak) starred Danuta Stenka as George Sand and Piotr Adamczyk as Chopin. Impromptu (1991) starred Judy Davis as George Sand and Hugh Grant as Chopin. Notorious Woman (1974) a 7-part BBC miniseries starring Rosemary Harris as George Sand and George Chakiris as Chopin. This page was last modified on 15 June 2017, at 22:36.